The chilly winter weather is in full swing and I just can’t get enough soup! Whenever it gets chilly and the days get shorter, it seems like it’s time for the soup and the casseroles. And what is better than a steaming bowl of good, old-fashioned chicken noodle soup? In fact, in addition to being the cure for all your illnesses, chicken noodle soup has always been one of my family’s favorite comfort foods. There’s something about the tender chicken, carrots, celery and egg noodles that is just perfect. But, well, the egg noodles are where it tends to go all wrong for those of us on Weight Watchers. Don’t get me wrong, I love pasta as much as the next person, and if you’ve ever had homemade egg noodles, there’s nothing like them. But they’re also high in calories and points. By the end of your bowl, you’re out of points for the meal but not out of appetite. I decided to lighten up one of my favorite comfort foods. It wasn’t hard, I just switched out the egg noodles with “zoodles”. If you’re not familiar with zoodles, they’re simply noodles that are made from spiral sliced zucchini. Using the zoodles, I was able to make my homemade chicken noodle soup recipe a LOT lighter and healthier. I can now indulge in one, or even two bowls of chicken noodle soup for just a few Points per bowl! Let me tell you, Chicken Zoodle soup is so incredibly delicious and satisfying. It’s also completely guilt-free! I love to make use of zucchini noodles in recipes like this. The zoodles have a light and mild flavor that perfectly complements whatever dish I use them in. I LOVE my zoodles. Spiralized zucchini can be used in so many recipes! I use it in place of pasta on a regular basis. It’s fast and easy to do. If you don’t have a spiralizer, I highly recommend one. I use this one, and while you can get smaller and cheaper ones, I really recommend spending a little more. It’s easy to wash (just do it right away and have a scrub brush handy or you’ll regret it) and it suctions to the counter so you’re not chasing it everywhere. This spiral slicer has 5 blades and you can make just about everything. You can spiral slice zucchini and sweet potatoes, you can make Arby’s style curly fries for the kids with it. I’ve used the ribbon blade to slice cucumber to make a cucumber, strawberry and goat cheese salad with poppy seed dressing. Chicken Zoodle Soup is one of my new favorites. It’s delicious and satisfying without all the points and guilt. I recommend baking the chicken breast, but if you’ve got leftover chicken breast that’s already cooked, it’s a quick and easy way to cut down on the prep time of this fabulous soup. If you love chicken noodle soup but have been avoiding it because of the high calorie noodles, this recipe will win your heart. Chicken Zoodle soup is delicious, a healthy spin on an old classic that’s the perfect way to warm up on a cold winter’s day. 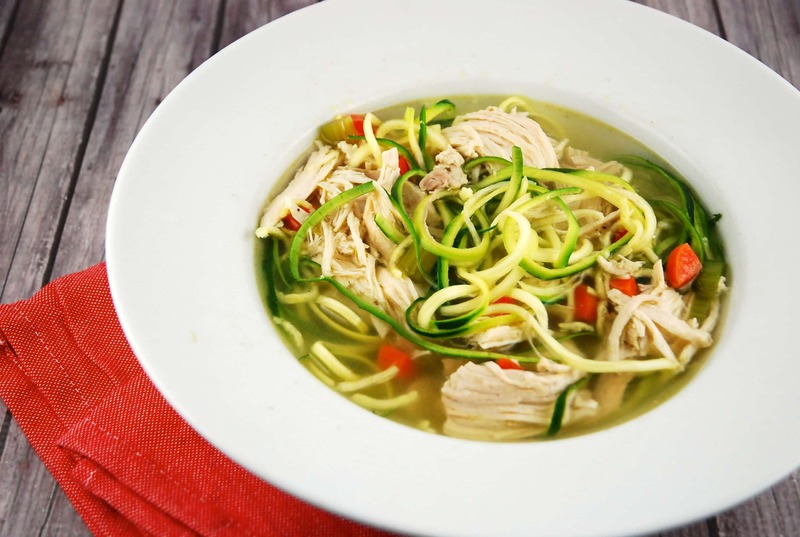 Get those veggie servings in by subbing out traditional high carb noodles for spiraled zucchini in this deliciously simple chicken soup recipe. It’s a perfect way to warm up on a cold winter’s day! Preheat oven to 400 degrees. Mist a baking dish with cooking spray. Place chicken breasts in the baking dish, and rub with olive oil. Season with poultry seasoning, and salt and pepper. Cover with foil and roast in the oven for about 30 minutes. Remove from oven and let stand for 5 minutes. While chicken is cooking, fill a large stock pot or Dutch oven with the chicken broth, carrots and celery, and set over medium high heat. Bring to a boil, then turn heat to low and cover. Using two forks, shred chicken and dump it all into the soup pot, including the pan drippings from the baking dish. Season soup as desired with salt and pepper, cover, and cook on low for about 20-30 minutes. Right before serving, add desired amount of “zoodles” to each serving bowl, and ladle the hot soup over it. Season with additional salt and pepper, if desired.